For each email added to the workflow, you can choose to send it to everyone on the list, or only people who meet a certain criteria. To do this you need to have male and female segments set up before creating the workflow. It doesn't matter if the segments are empty to start with because people will be added to them when they sign up. Tip: To ensure new subscribers are added to one of the segments, set the custom field on your form to "required," meaning the form cannot be submitted until the field is completed. 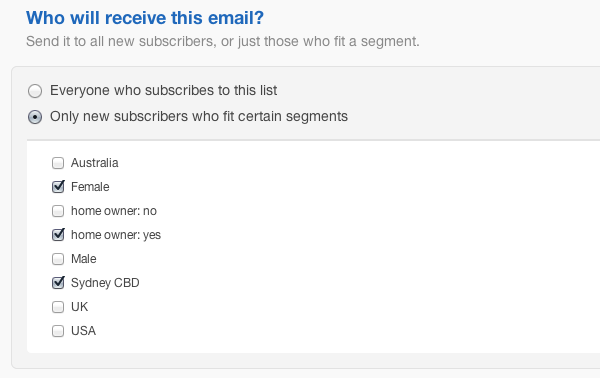 If you select more than one segment it means the email will be sent to people who are in segment A, or segment B, or segment C.
To email only subscribers who fit segments A, B and C, first create a segment using AND to group people who match criteria A, B and C, then select that segment when you're setting up the autoresponder.